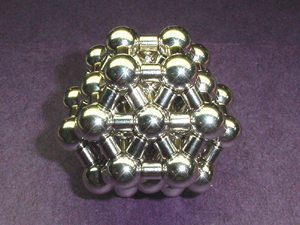 Take sixteen spheres and 24 rings and form the grid shape shown on the left. 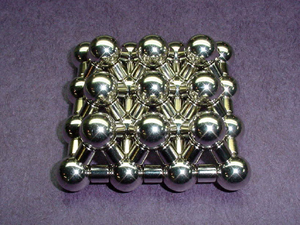 Take one more sphere and four rings and build a pyramid on top of four of the bottom spheres as shown. 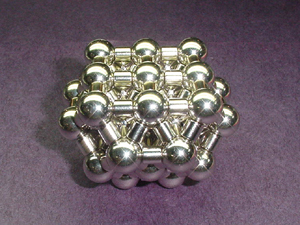 Using eight more spheres and 32 more rings, build pyramids on top of each square on the bottom level as shown. 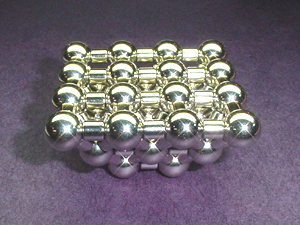 It sometimes helps if you have a non-magnetic stick or pencil to help position the rings on the spheres. A wooden or bamboo skewer works great for this purpose. 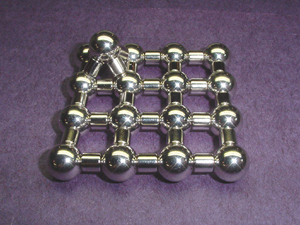 Connect the top nine spheres using twelve more ring magnets in the pattern shown on the left. 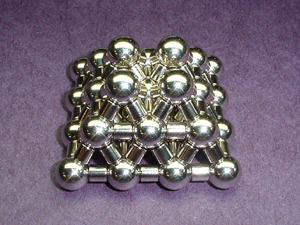 Build four more pyramids on top of the nine spheres of the second level using four more spheres and sixteen rings as shown on the left. 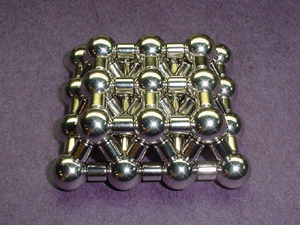 Connect the four top spheres using four more rings. You're halfway there! Flip the whole thing upside down. Build the next level of pyramids again, just like step #3. 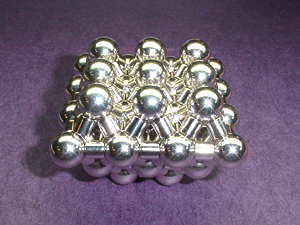 Connect the top spheres using twelve more rings. 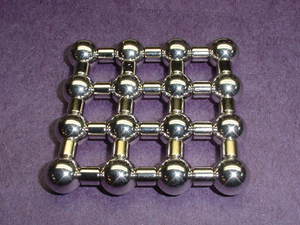 You now need to remove the spheres from the four corners (looking down on the scupture as it sits) and the four rings connected to each sphere. 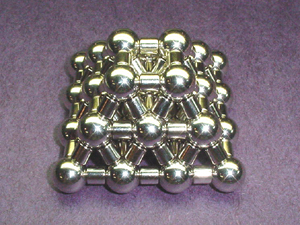 This is what makes it a "truncated" octahedron. 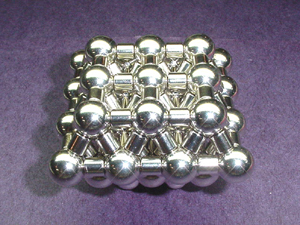 Now use the four spheres that you just removed from the corners and the sixteen rings to build pyramids on top (see step #5), then connect the top four spheres (see step #6) to complete the scuplture. Congratulations! 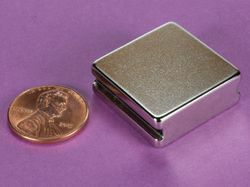 You now have a Truncated Octahedron of your very own! 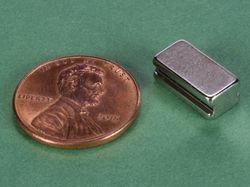 After you build this sculpture a few times, you will be able to save steps by building it without the corners that get removed in step #10.